"Location was great, small parking lot with the construction..."
Have a question for Kai Resort? "It was the perfect spot to stay or catch the seashore road to explore the island." "Nice spacious room and very clean." "Near beach and national park, many restaurant nearby"
Situated in Hallim, Kai Resort is the perfect place to experience Jeju Island and its surroundings. Set 25 km from the excitement of the city, this 2.5-star hotel commands an excellent location and provides access to the city's biggest attractions. With its convenient location, the hotel offers easy access to the city's must-see destinations. Offering hotel guests superior services and a broad range of amenities, Kai Resort is committed to ensuring that your stay is as comfortable as possible. While lodging at this wonderful property, guests can enjoy free Wi-Fi in all rooms, laundromat, taxi service, express check-in/check-out, luggage storage. Kai Resort is home to 22 bedrooms. All are tastefully furnished and many even provide such comforts as television LCD/plasma screen, cleaning products, clothes rack, mirror, slippers. The complete list of recreational facilities is available at the hotel, including hot spring bath, golf course (on site), golf course (within 3 km), outdoor pool, fishing. 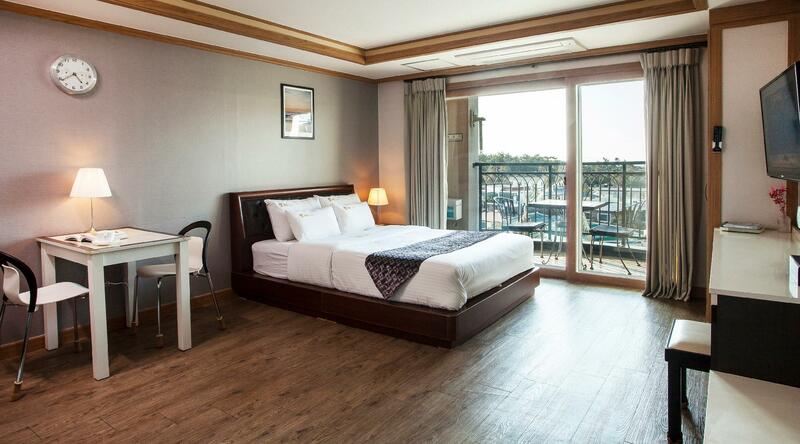 Whatever your purpose of visit, Kai Resort is an excellent choice for your stay in Jeju Island. "Room is clean , kitchen , fridge , small balcony ." 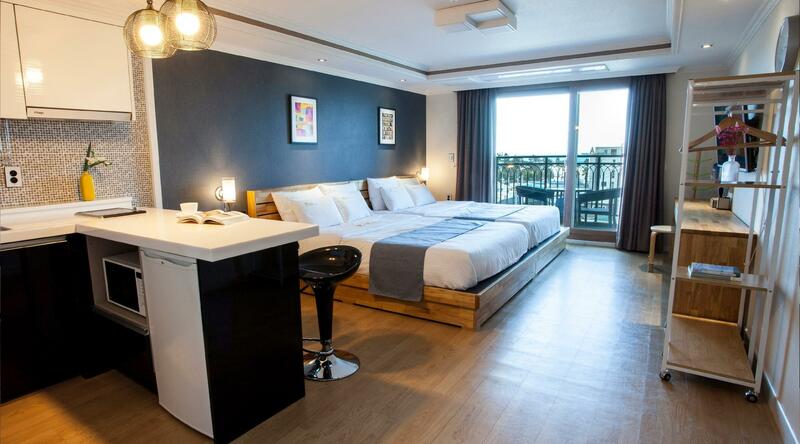 The Kai resort has super rooms, nice staff and is a short walk to one of Jeju’s big sandy beaches. The neighborhood has a bunch of cool and unique Korean and international eateries (Italian, Chinese, local seafood and unique places) and bars (all with Jeju Wit Beer!) in addition to all the usual Korean chain coffee shops. It was the perfect spot to stay or catch the seashore road to explore the island. Everything is good. We are very happy to stay here even for 1 night only. The room was large, with a balcony that face a lovely seascape. It had heated wooden flooring and a comfortable bed. There were cooking facilities for those so inclined, The bathroom was clean and well appointed. The young man at the reception was warm, helpful and incredibly courteous. At the entrance , there is a very good black pork barbecue restaurant. The town is a few minutes walk away and Hallim park a few minutes walk away in the other direction. A great introduction to Korean (Jeju) hospitality! Thanks Gimho! Lucky we rent a car. It took us 45mins to drive there. Thought we cannot really have a close up view of the sea. But there is a cafe nearby where u could sit beside the sea and take a sip. There is a bbq restaurant by the entrance, and it's nice. Have a try there. Also a convinent stall so u wun go hungry if h arrive late. Location was great, small parking lot with the construction of a newer building blocking the view of the option. They'd run out of twin beds, so they upgraded me to a family suite with bigger beds. Staff was friendly, room could have been cleaner, but I would stay here again if I wanted to stay near the beach in this quiet Jeju town. 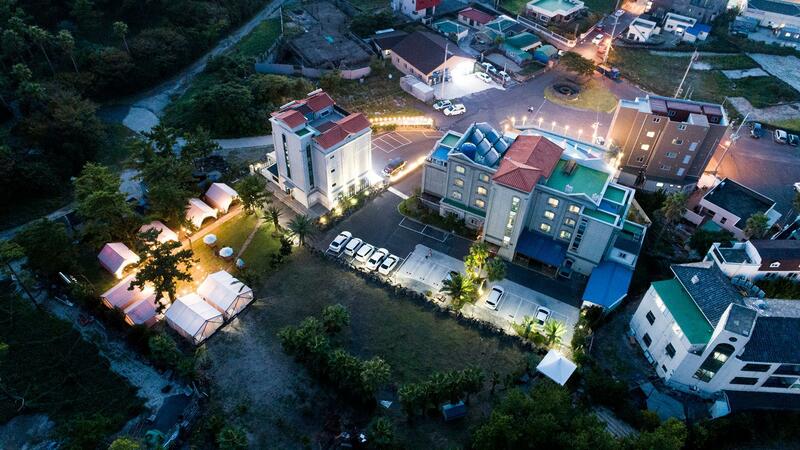 This hotel is in a quiet area, near a blackened pork, pizza, chicken, & seafood restaurants. There are also conveience stores near by too. The beautiful, clear watered beach is about 5min walk and Halim park is about a 10 min walk. The staff were friendly & helpful with helping us with the taxi service. It is a good place to stay while the location is not perfect. I really enjoy the big room with kitchen which you can make dinner by yourself. If you have a car, this is really a great place for you to have a rest. I highly recommend Kai Resort! It is out of the way from the touristy areas so the place is quieter. The beach is pretty close (pretty much across the street) and the view is awesome :) We have a rooftop, rental for BBQ, pool in the backyard and the resort is pretty new. The staff is absolutely gracious and the children are so adorable! lol. They are so helpful and friendly. Thank you for a wonderful experience!!! 3-5mins walking distance to the beach, lots of restaurants nearby, clean and tidy! It was a pleasant stay in Kai resort, although a bit far from the airport but Kai resort is near to the beach! The room is big and clean, have a mini kitchen which can cook a light dinner! Staff are friendly also. Nice environment, big room, suitable for family, no problem on communication with hotel staff, they are always trying to help. I booked this hotel because of the swimming pool facility. There are very few hotels with swimming pools in Jeju at affordable price. But unfortunately, maybe due to seasonal problem, the pool in this hotel was not running. Apart from that, this hotel's location is not in the center, and a little far from those famous scenic spots of Jeju, but very close to Hallin park which is very nice and a beach. Fast check-in, good Wi-Fi internet, and a small kitchen facility inside the room were handy. Potential downside to some, it's about 400m away from the beach, which was totally ok for us, and added another advantage of being somewhat away from a busy main road. Our stay at Kai Resort was very pleasant! The resort is very clean and well-maintained, and the rooms were big. The beds were also very comfortable, and the amenities for the bathroom were also well-equipped. The staff was a friendly young man who could speak English very well and he was able to recommend us to various dining locations that we requested for. our flight from seoul to jeju was cancelled due to bad weather in jeju (all flights unable to land) and rescheduled to the next day. we called kai resort around 8pm asking if we could refund and surprisingly they agreed! so, we shortened our stay from 3 nights to 2 nights. our stay in kai resort was awesome! the staff (son of boss) very friendly and attentive. he has been very helpful to us and he is the only one who can speak english in kai resort. the bedroom is huge with a balcony and a fully furnished kitchen. microwave, refrigerator, pots, frying pans, bowls, plates, cups, knife and cutleries are provided for your convenience. 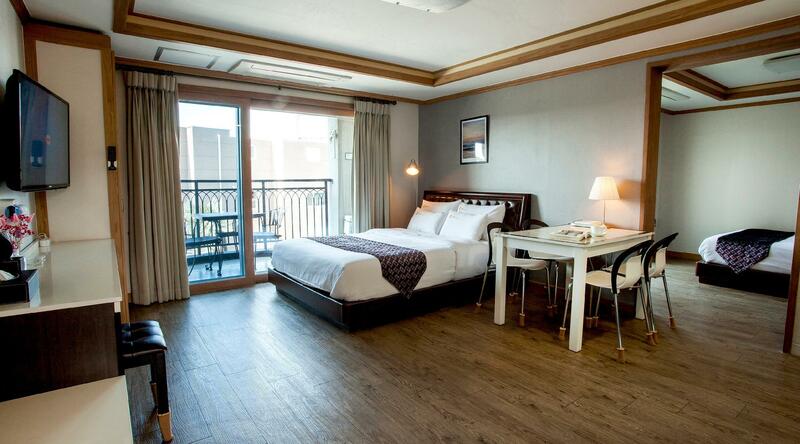 kai resort will be a good option if you plan to have a relaxing holiday in jeju. kai resort is located at the west side of the island and quite far from jeju airport about 40mins driving distance. if you plan to join bus tour (east course & west course), there will be no pick up service from this resort. It was an awesome stay at Kai Resort. The hotel staffs are very friendly and patience when i approached them for help to order food delivery or asking about good foods nearby. It's near to the sea thus, you able to see a good view of the beach and also, you can hear nature sound in the early morning. Room is clean , kitchen , fridge , small balcony . Stuff nice and helpful . You can exchange money at the lobby as there is no money exchange any close . Clean towels and water everyday . We had a good stay in Kai resort. The room was spacious, clean and comfy. Good sea view from the room and the beach and many dining options are just a short walk from the hotel. Over all a nice stay, the bathroom had some mold that could have been cleaned better yet was not everywhere that it grossed us out. The double beds were great however the pillows where uncomfortable (others might like them) Quiet area, nice pool, plenty of parking, worth the cost.